Dr. J. Paul Robinson, PUCL Director has just returned from Nepal having sucessfully summited the world's tallest mountain at 29,035 ft.
"My major motivation in climbing is to raise awareness of the devastating problems of AIDS in resource-limited countries and entire continents like Africa." Dr. Robinson’s goal is to raise money for Purdue's nonprofit "Cytometry for Life" program, which is developing low-cost diagnostic equipment to help HIV/AIDS victims in rural Africa receive treatments. Robinson has paid personally for his training and previous expeditions, as well as the Everest trip, so that all donations go into the C4L mission. To follow his progress, please visit www.cyto.purdue.edu/trackpaul . 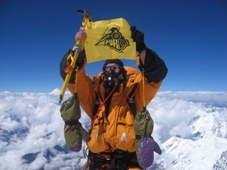 Read an article about this climb in "Inside Purdue." The Cytometry for Life program was initiated by individuals in the cytometry community who want to make a difference today- both academics and business people. The goal is to create a program that has as its primary goal, saving lives by using current-day technology at the most effective level and at the lowest possible cost. The consortium has already been successful in raising over $250,000 in funds. We have set two funding goals for the program. First to raise $1 million to get the technology and the reagents designed and robust. Our second goal will be to raise another $4 million to deliver the technology across the nations of need to save those lives from the pain and agony of AIDS to give these individuals at least a chance of raising their children, educating them and giving them an opportunity to impact their families well-being. This project will change the lives of millions of people, not only in Africa where we will initiate the program, but in many other resource poor nations. The "Cytometry for Life" program needs your help to achieve our goals of very cheap tests for AIDS victims in Africa. We are trying to get quality input into our CD4 project. In order to do this we have created a detailed survey that contains many questions about the CD4 assay and the conditions under which it is needed and carried out. Regardless of who you are or where you are from, we would like your opinion. In order to properly analyze the data however, we will need to know something about you - your experience level, your knowledge of the field, where you are located, etc. You can answer the general questions without identifying yourself, but we would like to have your complete contact information if possible so that we can continue to work with you on this project. The survey can be found on the SPONSOR page of this website.